Zesup® is indicated in zinc deficiency and/or zinc losing conditions. Zinc deficiency can occur as a result of inadequate diet or malabsorption, excessive loss of zinc can occur in trauma, burns, diarrhoea and protein losing conditions. A zinc supplement is given until clinical improvement occurs but it may need to be continued in severe malabsorption, metabolic disease or in zinc losing states. It is indicated in the following conditions - Recurrent respiratory tract infections, Diarrhoea, Loss of appetite, Severe growth retardation, Deformed bone formation, Impaired immunological response, Acrodermatits enteropathica, Parakeratatic skin lesions, Defective and delayed wound healing, Anaemia, Night blindness & Mental disturbances. Child under 10 kg : 5 ml (1 teaspoonful) 2 times daily. Child between 10 - 30 kg : 10 ml (2 teaspoonful) 1-3 times daily. Adults and child over 30 kg : 20 ml (4 teaspoonful) 1-3 times daily. This drug is most effective if they are taken at least 1 hour before or 2 hour after meals. However, if it causes stomach upset, this may be taken with a meal. This medicine should be used regularly to get the most benefit from it. 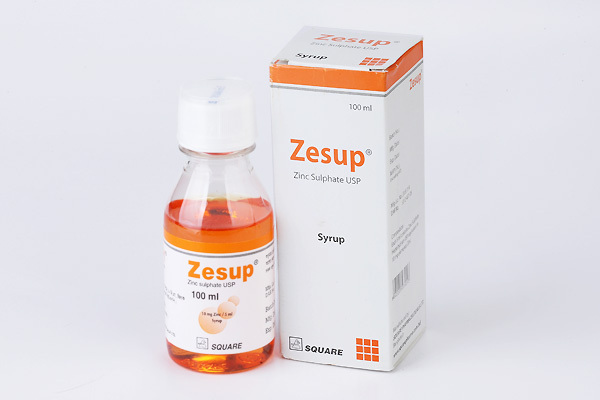 Zesup® Syrup : Bottle containing 100 ml syrup with a measuring cup.